PROVIDENCE, R.I. - The Providence College women's hockey team skated to a 3-1 victory over the UConn Huskies on Saturday, Feb. 2 at Schneider Arena. - UConn jumped out to a quick lead, scoring just 18 seconds into the contest. Briana Colangelo took a shot from close range that Madison Myers (Colchester, Vt.) saved initially. Savannah Bouzide was at the post to tap in the rebound for a 1-0 lead. - Providence responded with a goal from Sara Hjalmarsson (Bankeryd, Sweden) at the 4:42 mark. Hjalmarsson redirected Kate Friesen's (Altona, Manitoba) shot from the high slot past Mrogan Fisher for her ninth goal of the season. - Hayley Lunny (Bedford, N.Y.) picked up the secondary assist, which extended her point streak to three games. - The second period featured back-and-forth action, with the Friars holding a 6-4 advantage in shots. - Christina Putigna (Grimsby, Ontario) took the game's lone penalty with just 33.5 seconds remaining on the clock. The Friars were able to kill it off in the closing seconds of the period and the opening 1:27 of the third. - Emily Landry (Orangeville, Ontario) gave the Friars a 2-1 lead at the 5:35 mark of the final period. Neve Van Pelt (Mitchell, Ontario) drew the face-off back to Whitney Dove (Port Moody, British Columbia). She slid it across the blue line to Chloe Gonsavles (Toronto, Ontario) who found Landry in the middle. The senior forward roofed a shot over Fisher for her fifth goal of the year. - The Friars' limited UConn's chances in the third period, as each side only recorded six shots on goal. - Maureen Murphy (Bedford, N.Y.) capped the game with an empty-netter at 19:32 of the third. Her 21st goal of the season was assisted by Annelise Rice (Excelsior, Minn.). - With today's victory, the Friars finished the regular-season series against UConn with a 2-1-0 record. - Eight different Friars ended up recording a point in the game. 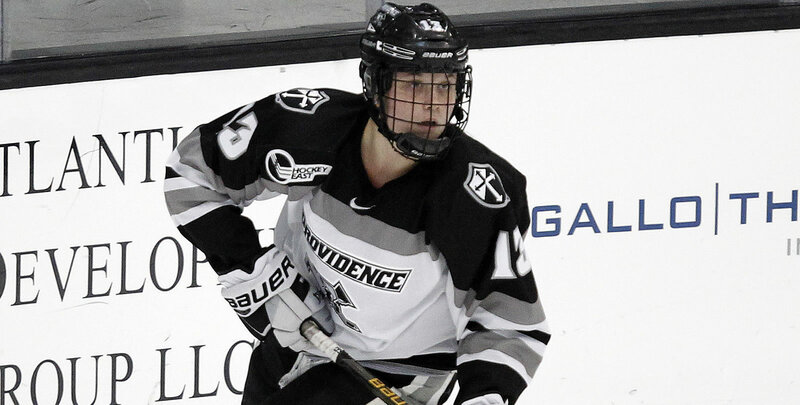 - Myers made 18 saves for Providence, while Fisher made 20 for UConn at the other end. Providence travels to Maine for a pair of games next weekend. Games are at 2:00 p.m. on both Friday, Feb. 8 and Saturday, Feb. 9.